Once again I am lucky enough to be working with Gift Company this Autumn to bring you a selection of items throughout November. All of these items would all make excellent gifts for people this Christmas. Check out my “Gifts” section of my blog for more examples of reviewed products. 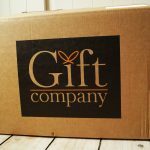 Gift Company is a wonderful UK based and family run company that prides itself on providing unique and quality giftware, homeware and furniture, to the people of the United Kingdom. Now on to the product itself, the Cat Lovers Cushion. (See image below). 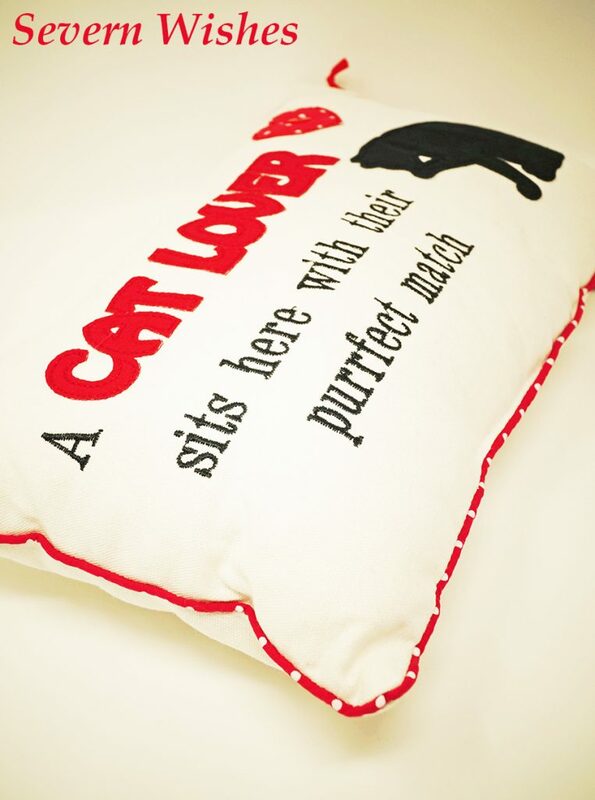 Item Description: A Cream Cushion with Red and Black Writing and a Black Cat. Item Dimensions: Length 34cm, Width 21cm, Depth 7cm. 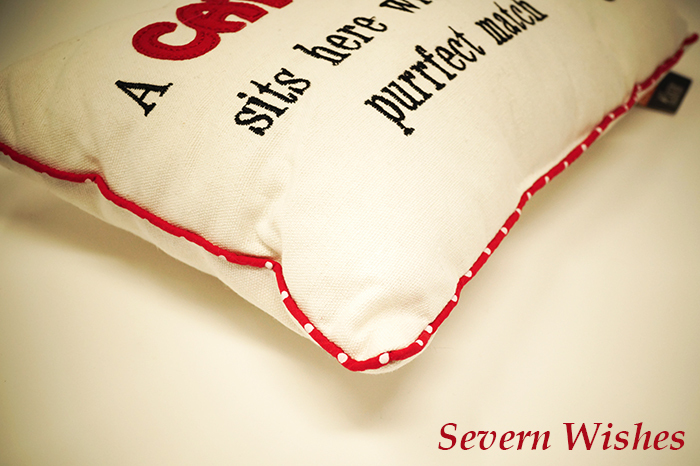 Item Details: This small yet sweet cushion is an ideal gift for anyone who loves Cats. It has some nice features including an accurately proportioned cat which is sitting on the right hand side of the cushion grooming itself. The embroidered writing consists of the phrase “A CAT LOVER sits here with their purrfect match”. The cushion is an overall cream colour so ideal for any room, with an additional trim to it which is red with white polka dots. It also boasts a sweet heart above the cat, made from the same polka dot material and featuring a red heart button in the centre. Item Price: £7.50 (RRP £15.00). Item Delivery: The item was delivered sealed in cellophane so you were certain it was brand new. ✩ An attractive clever design which is ideal for anyone who likes cats or has a cat/s. ✩ It is a versatile base colour so great to fit in with the decor in most rooms. ✩ Well made and well designed to incorporate humor in the wording. ✩ It is soft and nice to lean on or to cuddle up to and relax. 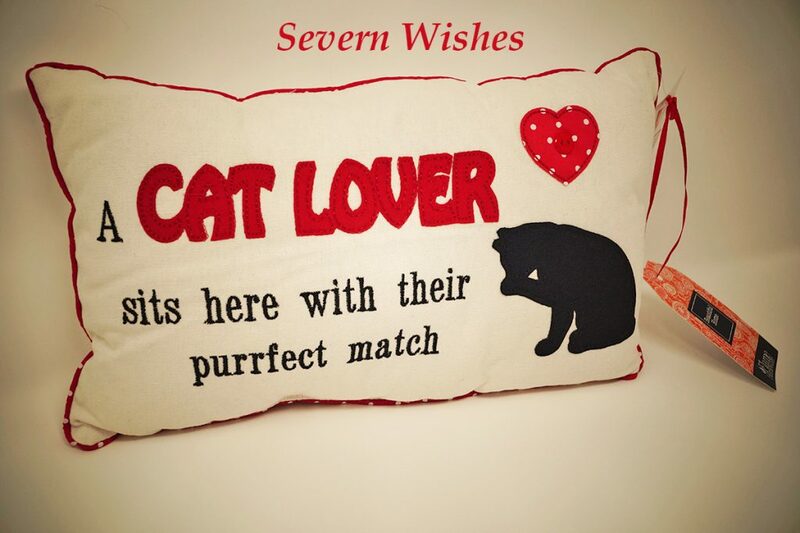 ✩ This cushion would make an ideal gift for a cat lover. ✩ This cushion states on the tags that the inner filling is tested and meets the 1988 safety regulations to be match and cigarette resistant, however the outer cover is not. This item could perhaps cause a fire hazard to a smoking household and I would therefore advise against its purchase if the people were regular smokers in their homes. ✩ No where on either of the labels does it say that the cushion can be washed, I am presuming then that it cannot be put in the washing machine or hand washed and is a sponge clean only item. I would advise not giving this item to a small child due to the button that could be pulled off. I was very excited about receiving a cat related item from Gift Company, and the appearance was one that I was most happy with. It wasn’t until I was meticulously detailing the cushion that I noticed it had no instructions label and I found the warning one about its cover. It’s a shame that this cushion wasn’t made more carefully to ensure a better quality of fabric used. The fabric itself is soft to touch and is by no means cheap, I thought it was lovely. I believe that if you were a careful household that kept the cushion away from naked flames I’m sure that the item would be thoroughly enjoyed by all cat lovers in the home. The embroidered details are lovely and it’s an ideal gift for anyone that enjoys the company of cats and the humor they bring to life. Of course if you are nearby to a Gift Company store you could go in and inspect the actual item for yourself and then decide if it’s right for you or the recipient. Please don’t be put off a great gift by the need to take care around it, or by my honesty. 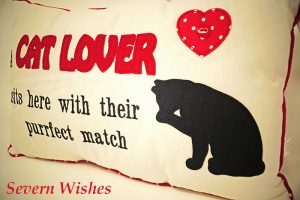 Gift Company also do a range of other Cushions such as ones for Dog Lovers, Golfers, you name it, so why not check the whole range out online (link at the end of the post). Thank you for reading this product review today, I hope that you have enjoyed reading about this great gift. You can see more information about the Gift Company stores and there are links to the online pages below. Gift Company approached me again this festive season after we collaborated last year, and I was more than happy to do some more product reviews for them. Every time we work together I am sent these items to review for free, in return for my honest opinions and photography. For this service I do get to keep the products. I personally use and test the items and through my own experience is how I write my review. I do not work for Gift Company, neither do I get paid any commission that is generated from any sales that may occur from my work. This entry was posted in Cat Related, Gift Company, Gifts, Homeware, Lifestyle, Photography, Reviews by Sabrina. Bookmark the permalink.